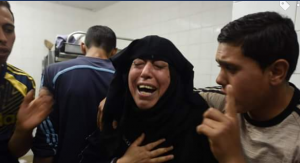 WRITE TO YOUR MP to ask them to call for an End to the Massacre, the latest of so many, in Gaza. UK MPs are largely a very compliant bunch, swaying with the demands of corporate-military power and the ‘right side’ that translates to in foreign policy issues. In this case it is of course Israel that’s favoured by the Western empire, not the Palestinians (nor Syria, nor Iran … yes to the Saudis – good arms buyers from US-UK, boosting the Mays’ personal profiteering, and an ally against Syria and Iran). So most MPs, bar the few truly compassionate, are almost certain to do nothing other than spout a few safe lines: “cause for concern”, “ask for restraint”, and not say anything that could possibly suggest they want Israel to be shamed for its extreme violence, brutal colonisation of Palestine or siege of Gaza. Nonetheless, imho we should stand together and show our MPs – and each other! – how we feel. Here’s a link to a pre-written letter which you can adapt. Or if you have time perhaps you can write your own and share it here and everywhere. Pls consider sharing this. Also on the SB facebook page. ← How the U.S. punishes those who vote against it at the U.N.